Groom Ruairi O Connor's reaction . . . Thank you Gerry form the bottom of our hearts . . .
for the outstanding wedding video you have produced from our wedding in Bellingham Castle. We are overjoyed with the attention to detail, the quality of sound, video and packaging and how you have captured, presented and told the story of our wedding from the beginning to end. Our Wedding was the most magical of days for us and thanks to you and your expertise we now have our beautiful story to enjoy ourselves and proudly share with our family and friends. We simply cannot thank you enough. All our love and best wishes for the future. "we LOVE our Wedding DVD and can't stop watching it Gerry." . . .
Groom Paul McArdle's reaction . . .
Paul wrote the following to Gerry, on the day after his wedding . . .
Just want to say thanks Gerry for helping to make myself and Aine's wedding a day to remember. You were a constant professional as well as great craic to work with and really put all of us and ease and hopefully the results will show on the video. We look forward to the end result and would highly recommend you to absolutely everyone. Thanks again. Bride's Reaction - Aine McArdle's follow-up . . .
Paul's wife Aine; on the evening she collected her Wedding DVD . . .
Paul and myself just watched our wedding video and we are delighted with how it turned out ! It was so well put together and brought back so many memories ! Thanks so much Gerry, we will definitely be recommending you to other couples! "You are a very worthy winner" . . .
Former - General Manager of the Canal Court Hotel in Newry . 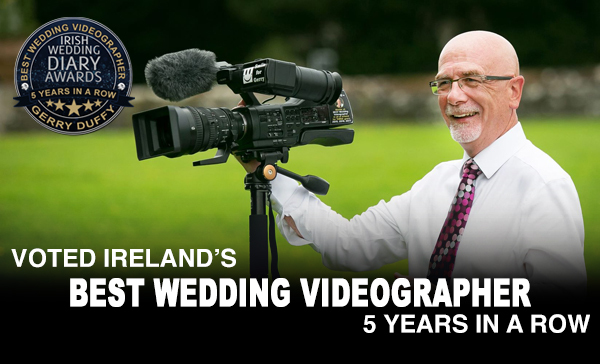 . .
Congratulations on winning the "Best Wedding Videographer in Ireland" ... well done, you have worked hard to make special memories for people over many years - You are a very worthy winner. We are thrilled with the Wedding DVD you produced for myself and Paul. "You are a True Professional" . . .
"Gerry did a fantastic job on our wedding DVD" . . . He blended seamlessly into the background while still capturing all the important things. We would highly recommend his service ! "Thank you Gerry for everything you did at our wedding" . . . I will highly recommend you to everyone I know. You are an absolute star ! "Thank you so much Gerry" . . .
"Thank you Gerry" . . .